Located in Taormina’s old town centre, Porta di Mezzo Luxury B&B takes its name from the city gate “Porta di Mezzo”, also known as “Torre dell’Orologio” (Clock Tower), which is just a few steps away, midway down Corso Umberto, the pedestrian shopping street and thoroughfare that leads to the panoramic Piazza 9 Aprile. The closest airport is Catania Fontanarossa, just 45 Km away. Il Picciolo Golf Club is 32 Km away. 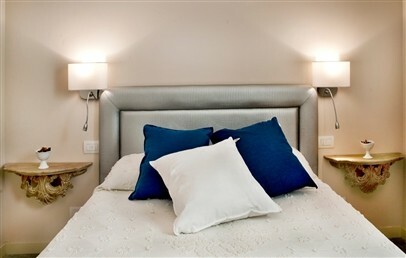 The elegant building, adjacent to the Tower walls, features four stylish rooms that offer all the comforts of a luxury hotel. 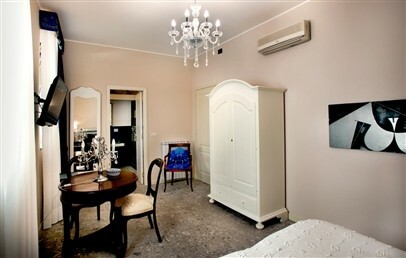 A traditional Taorminian house tastefully furnished with Sicilian-style period furniture, offering excellent attentive service. The rooms are named after great men who have either honoured Sicily through their art or extolled Taormina’s beauty around the world. 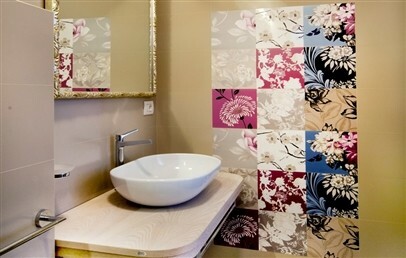 J. Wolfgang von Goethe Deluxe – elegant 21 sqm room featuring a large shower with mosaic floor. 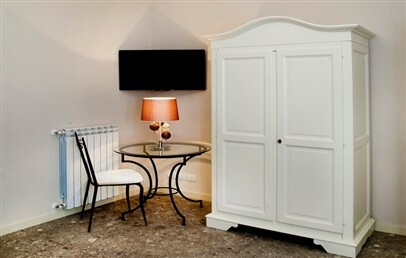 G. Verga Junior Suite – elegant 27 sqm room featuring a large shower with white and blue ceramic decorations. 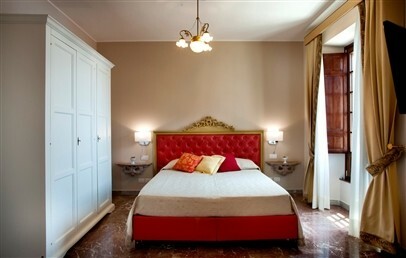 Suite Le Mura – elegant 27 sqm suite overlooking Corso Umberto and the sea. 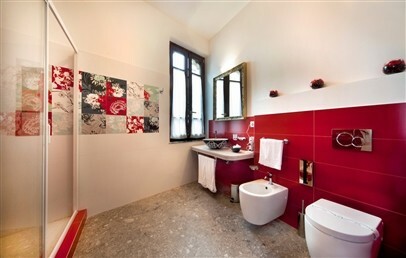 Suite W. von Gloeden – spacious 40 sqm suite, comprising three separate areas, overlooking Corso Umberto and the sea. In the morning, a well assorted continental breakfast buffet includes cakes and organic products, such as marmalades, jams and honey produced on the foothills of Mount Etna. Staff in reception will be happy to recommend the best restaurants for lunch and dinner and provide information on evening entertainment. Free Wi-Fi connection is available throughout the premises. Upon request and subject to availability guests will have access (at an additional cost) to the Spa that is located just 50 m from the hotel and the swimming pool of a luxury partner hotel, just 10 m away. The concierge will be happy to provide information on local excursions, rental services and bookings for Il Picciolo Golf Club. 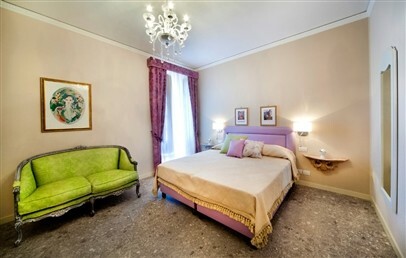 An elegant room with local handcrafted furniture and curtains and Murano glass lamps. 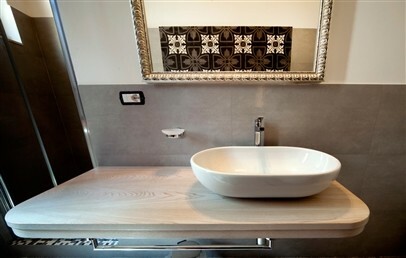 The bathroom features handmade white and grey ceramic decorations and has a large shower with a mosaic floor. The room overlooks Via D’Orville and the Hotel’s main entrance. This suite is adjacent to the Clock Tower walls, which are visible inside the bathroom shower. 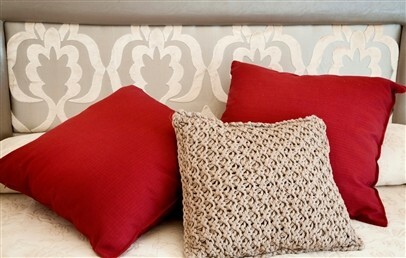 It features local handcrafted furniture and curtains, beautiful floors and Murano glass lamps. 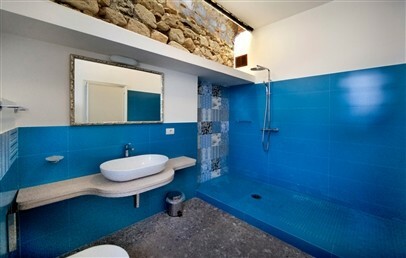 The bathroom has white and blue ceramic decorations and a large shower in which the old city walls are a unique feature. Courtyard view. This suite, adjacent to the Clock Tower walls, has local handcrafted furniture and curtains, beautiful floors and Murano glass lamps. The bathroom features hand-made yellow, white and green ceramic decorations. 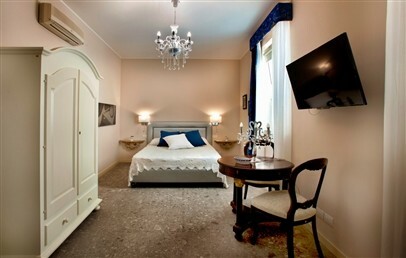 The suite overlooks Corso Umberto and the sea. 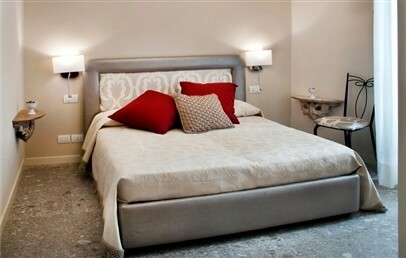 This spacious suite comprises three separate areas and features local handcrafted furniture and curtains, Taormina red marble floors and Murano glass lamps. The bathroom has red and white ceramic decorations. 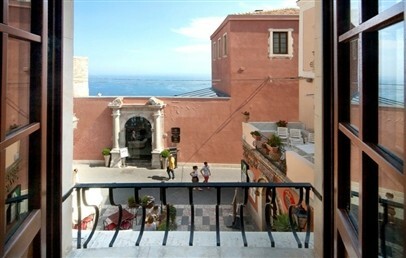 Its four large windows overlook Corso Umberto, and one offers views of the sea.